Southwest Wildlife & Conservation rescues, rehabilitates, and releases injured, displaced, and orphaned wildlife. Wildlife education includes advice on living with wildlife and the importance of native wildlife to healthy ecosystems. Educational and humane scientific research opportunities are offered in the field of conservation medicine. Sanctuary is provided to animals that cannot be released back to the wild. 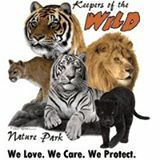 At Keepers of the Wild, the preservation and protection of wildlife is paramount to our goals. We are dedicated to the protection of abused, neglected, abandoned and retired captive wildlife. To provide the best standard of care and help enforce the humane treatment of all animals.